Fig. 1 shows the general field layout with the 71 subsea wells and nine production manifolds and the flowlines, risers, and control umbilicals that cover a subsea footprint of approximately 100 km2. ging loop is mounted on the open side of the manifold, permitting roundtrip pigging. The control umbilical essentially is daisy chained from one manifold to the next. The rigid jumpers are not in contact with the seabed but float approximately 2.5 m above it because of attached buoyancy aids. Advances in directional horizontal drilling and the use of simplified completions have enabled the wells to be grouped in six-well clusters, which not only facilitates batch drilling, where necessary, but also reduces the number of subsea flowline and umbilical connections. Similar to Girassol, the same single-line header design is used to bring water and gas to the relevant wells. 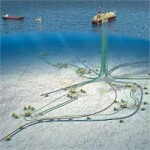 Control umbilicals are laid adjacent to the flowlines with subsea distribution units (SDUs) connecting the trees by electrical and hydraulic flying leads deployed by a remotely operated vehicle (ROV). Horizontal-Christmastree technology has been selected that is compatible with a 7-in. full-bore completion and permits an efficient sequence of operations, giving the possibility of batch drilling with a minimum number of rig moves. Additionally, the trees have the drill-through capability that for a light-architecture-type well, lets the tree be run before the blowout preventer (BOP). With the tree and BOP in place, the well then can to be drilled, cased, and completed. Two architecture types are used, with the majority of the wells being the lightarchitecture type, based on a threecasing program, including the 36-in. conductor pipe and 183/4-in. wellhead housing. In the base-case scenario, 10% of the wells are planned to be heavyarchitecture wells, based on a four-casing program, including the conductor pipe. In both designs, the wellheads are standard 183/4-in. external diameter, but for the light design, the wall is thicker to connect only the 14-in. and the 103/4-in. casing hangers. The smaller-bore drill-through 13-in. horizontal tree then is installed on the wellhead and tested before BOP-stack installation and testing. The conductor housing interfaces with the guide base that provides the final guidance for the Christmas tree. Installed together after jetting the 36-in. conductor pipe, the guide-base heading can be adjusted by an ROV to an accuracy of ±1° and includes a receptacle for an orienting stab in the jumper-spool connection to the manifold. The Christmas tree provides a complex subsea valve arrangement to control the flow of produced fluids from or injected water or gas into the reservoir. It also provides vertical access into the well for workover intervention. The tree bores are 51/2 or 7 in., depending on specific well requirements. Working pressure is 5,000 psi, and the tree measures approximately 5.1×4.2×3.5 m. Dry weight is 40 tonnes. One well-established advantage of using horizontal Christmas trees in deep water is elimination of the expensive, mono- or dual-bore workoverriser system, with its specific control facilities. It is usual that these systems are deployed, for safety reasons, through the drilling riser and BOP and offered on a rental basis for fields with a limited number of wells. However, with potentially as many as 100 wells, the decision was made that Dalia would invest in two workover systems and maintain them under safe storage between interventions. Each manifold assembly consists of a foundation bottom structure and manifold. The foundation bottom structure comprises a suction pile and a manifold-support structure that is adjustable in level to ±5°. The manifold includes large- and small-bore piping, connection hubs, and protective structure. In case of a major problem with a manifold, after loop shutdown and full disconnection of all the lines and umbilicals, the top unit can be recovered to the surface. As opposed to three types of subsea connection systems used in Girassol, Dalia uses just one standard for all field-deployed connections. The production tree is connected to the manifold connection hub by way of a 6-in. rigid jumper in a “J/L” shape, floating above the seabed. The 2-in. methanol and service lines and the 3/4-in. hydraulic and chemical lines also are connected at the same time by use of a multiported horizontal hub and clamp connection. The well jumper, complete with hubs and insulation boxes at both ends, is lowered from the surface vessel with a lifting frame. The first jumper end enters the manifold porch and is rotated before the second end enters the tree guide base. A stroking tool deployed by ROV pulls the outboard termination into place at both ends. A standard torque tool then closes the clamp connectors. The two connections then are tested by ROV, and finally, the insulation boxes are fitted and sealed. This same method is used for the production-spool-toflowline connection system and control-umbilical connections. Again, this system is used for the connection of the injection wells where the two additional electric jumpers then are connected to each tree control module. Many special tools have been developed, such as a cleaning tool, a sealreplacement tool, a torque tool, and a stroking tool, and are deployed by ROV from a subsea work basket. This ROV-tooling philosophy optimizes seabed-operation timing by limiting the number of ROV dives. 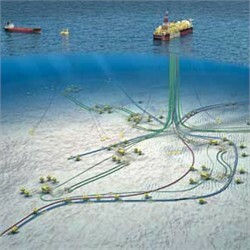 The operating control system for the Dalia subsea production system is one of the largest and most complex to date. It has been designed to control as many as 100 subsea wells (including intelligent downhole completions), all associated manifolds, and all chemical-injection requirements needed to manage the heavy-oil production and low operating temperatures. The basis of design is an electrohydraulic multiplex system that is industry proven for deepwater operations, with a number of key innovations. The integrated control and safety system (ICSS) was designed to ensure the safe operation of all facilities topside and subsea and to fulfill requirements of the operating and safety philosophies. The ICSS is operated from the central control room and is connected to the subsea control unit (SCU) through a data highway and separate workstation dedicated to the subsea operation as part of the main station. Dual-redundancy computers are located in the instrument room. The SCU controls the hydraulic power unit (HPU) and all the subsea facilities by means of a number of gateways called operation process control (OPC), all interconnected by a dual data highway. Each OPC is connected to two subsea production-control units (SPCUs) and two umbilicals. All communication cables are duplicated, and productioncontrol umbilicals are configured in a closed loop for 100% redundancy. Each production loop is connected by one OPC gateway and two SPCUs. The HPU provides control fluids to actuate valves at 270 bar in the trees and the manifolds and at 700 bar for the 51/2- and 7-in. flapper-type downhole safety valves. Production umbilicals are connected subsea to the manifold by means of a termination head and a manifold control module mounted on top of the structure. From there, each Christmastree-mounted subsea control module (SCM) is connected by means of flying leads for electric power and signals. Hydraulic lines and chemical lines are hard piped and mounted piggyback on the rigid jumpers of the tree. The SCM consists of solenoid control valves, pressure transducers, flowmeters, filters, and two (dual-redundancy) subsea electronic modules (SEMs) housed in a nitrogen-purged housing. Additional sensors such as the multiphase meters, sand detectors, chemical-injection throttle valves, downhole gauges, and downhole interface units are all controlled by means of the same system. All subsea process sensors have dual redundancy and are arbitrated by the OPC with a predefined algorithm. The OPC simplifies the interface between the SCU and subsea equipment while minimizing software implementation efforts. In addition, considering the field operations, software with the overall control of wells and risers assists the control-room operations staff with management of the subsea control by reducing the number of tasks to be executed and in preventing operational upsets from flowline and riser slugging.